When Jordan Peele and Keegan-Michael Key began their sketch comedy series in 2012 I wasn't aware of either comic in any large capacity save for a few supporting roles in random comedies. While I never jumped on the bandwagon that was the huge following their Comedy Central show soon amassed I saw enough clips on YouTube to know these guys were smart, insightful comedians who enjoyed commenting on social expectations by upending them in inventive ways. Most of these having to do with race or gender stereotypes, but nevertheless they were smart enough about their approach that many of their sketches quickly became cultural reference points in the same way Chappelle's show had a decade earlier. When Key and Peele's show ended in the fall of last year it was somewhat surprising given their three year run had yielded them great success, numerous opportunities, and it more or less seemed as if the duo were just beginning to really heat up. Talk about going out on top. It seems that with all the free time ending their show opened up for them the comedic duo decided it was time to take their act to the big screen. With the danger of wearing out their welcome by translating what worked for them in a five minute sketch to feature length as well as taking into account the low success rate of sketches turned into feature films the odds were never in their favor, but alas Key and Peele have made their formula work for them more than it doesn't. Again, coming from a position of having seen only a handful of sketches from what I'm sure is a much larger, more illustrious library than I can even imagine I wasn't exactly sure what to expect from Keanu, but due to the fact I largely enjoy broad comedies with outlandish premises that expose those premises for all they're worth Keanu largely succeeds in the goals it sets for itself. Of course, given I'd seen only what is likely the highest highlights from their show I was hoping for more consistent laughter, but there are enough big laughs here to tide one over when the movie intermittently forgets what it's supposed to be in exchange for the authenticity of what it is supposedly lampooning. Clarence (Keegan-Michael Key) is happy to see his cousin Rell (Jordan Peele) find happiness in the company of his new pet. Written by Peele and longtime collaborator Alex Rubens Keanu seems to be very much inspired by 2014's Keanu Reeves comeback flick, John Wick. The film is so in tune with spoofing such over the top action movies that the opening scene sets up an elaborate drug operation taking place in an abandoned church. The ringleader of such activities sits at a head table counting his money and petting his kitten. It's a cute cat, sure, and all seems splendid until two long-haired, trench-coat wearing, Boondock Saint-looking dudes bust into the place with their aerobics and guns and shoot up the place. 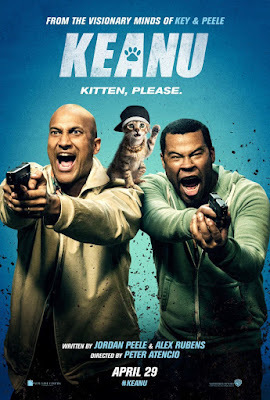 Known as the Allentown Boys (Key and Peele in appropriately ridiculous make-up) they essentially massacre this competing drug lord setting in motion a chain of events centered on the pet cat that narrowly escapes the ambush. Apparently, the Allentown Boys weren't after any money or drugs though, but rather the kitten specifically. 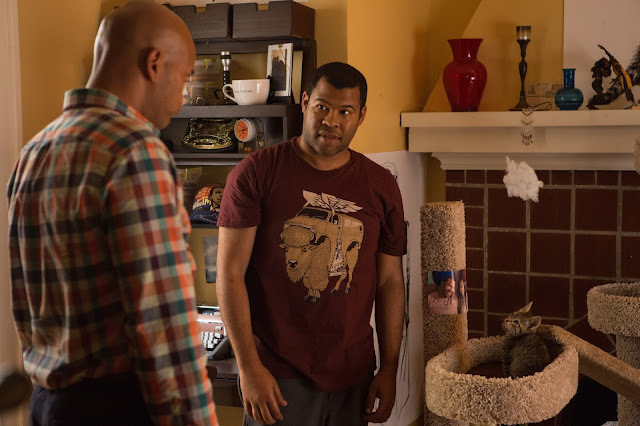 This makes the coincidence that the kitten eventually makes his way to the doorstep of Rell Williams (Peele) that much more of a function for the sake of plot and therefore that much funnier. Rell has recently been broken up with by what we assume is a longtime girlfriend or at least his grief would suggest as much. It is when the former drug kitten shows up on his doorstep that Rell's life immediately becomes that much more meaningful. Rell immediately dubs the cat "Keanu" which he thinks means "cool breeze" in Hawaiian and whom he begins using as a model in his calendar photo shoots that re-enact his favorite scenes from classic movies. While this behavior might immediately strike one as a sign Rell has some serious obsession issues these are only made worse when Keanu disappears from Rell's apartment one night when he is out at the latest Liam Neeson actioner with his cousin, Clarence (Key). Clarence, on the other hand, is the personification of what one would imagine when they imagine a black comedian impersonating a white person. He is a homemaker whose wife (Nia Long) may or may not be having an affair with family friend, Spencer (Rob Huebel), but when his cousin needs him he is there for him as Rell and Clarence end up posing as drug dealers for a street gang in order to retrieve Keanu. And so, it is easy to see how one might get carried away with such a premise, but director Peter Atencio (who directed numerous episodes of Key & Peele) who is also making his feature debut here, is so in tune with his stars comedic sensibilities that his direction compliments the tone and aesthetic they seem to have been shooting for the majority of the time. For instance, in that aforementioned opening action sequence it is clear what is being aimed for is the look and feel of a big budget action flick with high-flying stunts and slow motion gun battles. Atencio delivers as much in grand cinematic fashion with the comedy highlight being the fact this cute, innocent looking kitten is making his way through a maze of bodies and gunfire and in slow motion at that. Meshing these elements in this fashion provide slight chuckles, but it is once Atencio is able to train his camera on Key and Peele that he slips more into his comfort zone and thus doesn't utilize as many tricks of the trade to drive their story. In many ways, Atencio has a long way to go in terms of this scale of filmmaking as many of the conversation pieces feel rather pedestrian, but every now and then we'll see a flair of creativity that lends hope for whatever future big screen collaborations he tackles with the comedy duo. It is in these stretches of uninspired filmmaking that an emphasis is placed on the character interaction and the jokes. Lucky for Atencio, Key and Peele both know what they're doing as far as delivering jokes and playing into other movie tropes that they mean to alter by making subtle comments and changes that provides some not so subtle laughter. The key to a good comedy is the element of re-watchability that it contains though, and as far as Keanu is concerned there are enough over the top outlandish moments to make up for the sometime lulls that happen in between such set pieces to warrant it as future background noise. That may sound like faint praise, but it will inevitably end up making the film that much more endearing. Even if the running jokes and intended show-stoppers don't land as hard as the comics originally hoped, there is more to have fun with here than not and in the realm of such comic subjectivity one must count that as a win. Cheddar (Method Man) is keen on keeping Keanu all to himself. While Keanu has its fair share of peaks and valleys the greatest asset it was always going to have was the onscreen chemistry between its two leads. While Peele more or less gives himself the role of the straight guy here, having only a few opportunities to really go big with his performance, he does develop a nice chemistry with Tiffany Haddish who plays a member of the gang Rell and Clarence accidentally fall into. Key, on the other hand, is as strong here as he's ever been. I feel something more of a connection to the outrageously energetic personas Key tends to adopt for his movie appearances as audiences saw a variation of this in multiple films last year (Pitch Perfect 2, Vacation, Tomorrowland) and here he is simply in overdrive. The catalyst for much of the humor in Keanu is Rell and Clarence's need to stoop to the social expectations for African-Americans today by cussing excessively and dropping the N-word as casually and as often as they can, but while this shtick runs thin pretty quick the commitment from Key to play up these elements as well as other aspects of his character that see him worshiping George Michael to the point that in one of his narcotic-induced black-outs he dances along with the former Wham! singer in his video for "Faith." While Key and Peele play off one another as well as I've ever seen, taking the material as seriously as they can for the sake of the laughs, they have surrounded themselves with a solid supporting cast of willing players that do the same in both upending expectations yet simultaneously taking the material seriously enough that it's impossible to not at least chuckle. From Method Man to Will Forte down to appearances from Anna Faris and Luis Guzmán there is a sense of surprise by these cameos, but that fortunately isn't where the joke stops. Rather, Peele even goes so far as to somewhat parody the significance of cameos by famous people with a nod that lands one of the best yet most casual jokes in the entire movie. 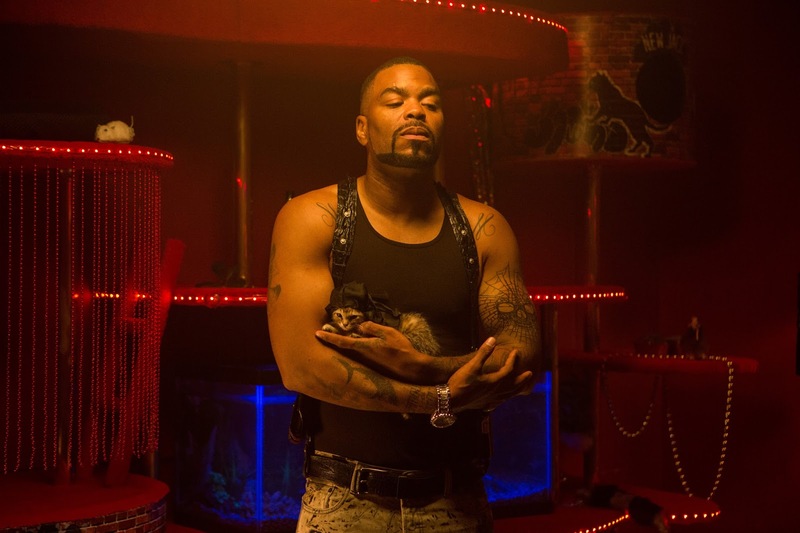 Key finds a nice comfort zone with Method Man's lackeys including Jason Mitchell (Straight Outta Compton), Darrell Britt-Gibson, and Jamar Malachi Neighbors that also provides some solid ensemble comedy. All in all, Keanu goes where one hopes it will not letting seasoned audiences down in such regards, but it doesn't go where you don't expect which ultimately separates the good from the great in terms of comedy.